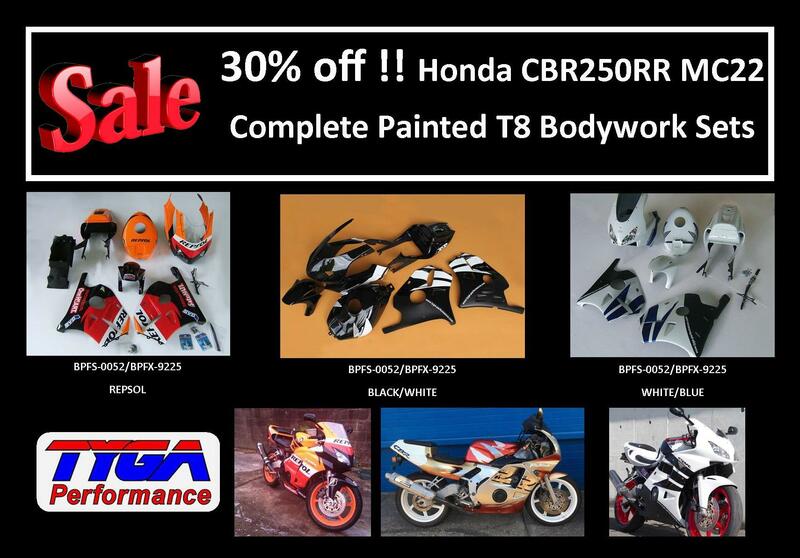 Due to popular demand, we have bodywork available for the little CBR250RR. This takes styling cues from the RC211V and totally modernises the look of the popular quarter litre sportsbike. This bodywork panels use the minimum of components to keep cost and shipping down and there are no compromises with practicality as the bike retains all its stock capabilities in terms of steering, mirrors, instrument positioning and luggage space. The parts can be bought as kits, (upper fairing kit and seat cowling kit) and we also offer stock shaped lower fairings as well as front fenders to complete the transformation bringing the bike right up to date. The bodywork is made from high quality GRP using cross weave mat with an excellent finish on both outside and inside. We use epoxy resins for superior strength, while at the same time allowing for light and flexible panels. The bodywork is supplied predrilled for easy fitment and uses either the original CBR250RR parts or fasteners supplied in the kit for easy fitment. Passenger Seat Cover, GRP, MC22, Assy. Rear Fender Special, GRP, MC22, Assy. Seat Cowling, Street, GRP, MC22, Street, RC211V Style, Assy. Upper Cowling, Street, GRP, MC22 Upper Cowling, T8, Assy. Upper Cowling, Street, GRP, MC22, RC211V Style, Assy. Upper Cowling, Street, GRP, MC22, Stock Shape, Assy.